Rating: 4 ♥ / 5 ♥ – I really liked it! Wendy’s journey leads her to a mysterious hidden cove inhabited by a tribe of young renegade surfers, most of them runaways like her brothers. Wendy is instantly drawn to the cove’s charismatic leader, Pete, but her search also points her toward Pete’s nemesis, the drug-dealing Jas. Enigmatic, dangerous, and handsome, Jas pulls Wendy in even as she’s falling hard for Pete. I love the story of Peter Pan, so I knew right away that Second Star by Alyssa B. Sheinmel would be finding its way into my hands. While not a traditional retelling by any means, it is a wonderful interpretation of the story of Peter, Wendy and the Lost Boys. Surfers, drugs, run aways and a narrator who is not all that reliable make for an addictive read. I figured out fairly early on that we as readers would need to come to our own conclusions about whether Wendy was really experiencing life in the cove with Pete, Belle and the boys or if she was lost in her own mind. Alyssa B. Sheinmel does a wonderful job of keeping the Peter Pan narrative alive in this entirely modern story. Instead of a pirate, Jas is a drug-dealing bad boy who Wendy finds herself falling for. But at the same time, she has feelings for Pete. I know I usually hate love triangles and insta-love, but this is different. Not quite either, but so real to Wendy. Her search for her brothers is heartbreaking and the run-around she gets from Pete and Jas, and Belle (so like jealous Tinkerbell, I loved her) makes you feel so badly for her. Wendy has a tough time in the book, so while I may not have loved her actions the entire time, it all makes sense for the plot. The idea that Wendy is just hallucinating the whole experience due to drug use and desperate need to believe that her brothers are alive and waiting to be found and brought home permeates the second half and end of the book. 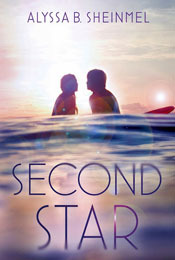 Second Star takes you through this journey to reunite Wendy, Michael and John and then drops you into the hospital with Wendy. But like all good books, it leaves you guessing. The smallest bit of evidence that maybe, Pete and Jas and Belle do exist, and her brothers are out there arises – but so does the idea that Wendy is just hallucinating again. It’s very well done! e-ARC received for review through publisher and Netgalley in exchange for my honest opinion. Thank you! If you live afraid to tumble and fall – you may never get to live at all. The world is spinning in the shadow of oncoming disaster. An asteroid is set to strike the earth in just one week’s time; catastrophe is unavoidable. The question isn’t how to save the world – the question is, What to do with the time that’s left? Against this stark backdrop, three teens are swept into intertwining stories of love, friendship, and family. And with the ultimate stakes at hand, each has every reason to do extraordinary things. Irresistible and inspiring, Tumble & Fall is a powerful novel of courage, love, and hope at the end of days. Tumble & Fall by Alexandra Coutts is a story about the end of the world that doesn’t really revolve around the end of the world. Told from the point of view of three teenagers, the story is one of family, friendship, love, lose and surprisingly, new beginnings. When you know your way of life is about to end, maybe permanently, how do you spend those last few days? Zan, Sienna and Caden each go through an incredible journey over the course of the novel. All three characters are living on the same island and while their stories never really intertwine, they do cross paths at moments to create a cohesive end to the story. Caden lives with his sister and their alcoholic mother, and while he doesn’t have any spectacular plans for his last few days before the asteroid hits, that all changes when his father shows and takes Caden away to the mainland for very sketchy reasons. Caden’s point of view was probably my least favourite, mostly because a lot of the motivations didn’t make sense to me, and it was very removed from the tone of the rest of the book. Zan’s scavenger hunt for a girl her deceased boyfriend Leo had a phone number written down on a receipt for was my favourite storyline. Along with Leo’s best friend Nick, Zan takes off for Boston to see if she can locate this girl and put to rest the question of whether Leo had been cheating on her. It’s an interesting view on questioning every thing you had known, and not being able to get answers from the person involved. It talks about trust, moving on, guilt and love. Sienna also has an interesting story, revolving more around family and what it means, and young love. I definitely felt she and Owen, a boy she knew from when her family used to summer on the island, fell in love extremely quickly, but Sienna is a teenager, and it’s the end of the world. Why wouldn’t she think she was in love. Usually I’m very against insta-love in books, but this time it made sense and worked. The idea that an impending asteroid hitting the earth could wipe out life as we know it creates an intriguing background for a story that deals with a lot of tough themes; from depression, alcoholism, love and kidnapping to trust, what it means to be family, and kindness. Caden, Sienna and Zan all have a moment where their lives cross near the end of the book and then the last day before the asteroid is supposed to hit and everyone on the island comes together in moments of solidarity and hope and fear and waiting. I was extremely happy with the ending and even though some may not like the ultimately unresolved nature of it, I felt it fit the book perfectly and couldn’t have been done any other way. 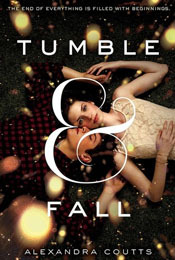 Tumble & Fall by Alexandra Coutts is a quiet sort of disaster book. Focused more on the characters and how they choose to spend their possibly last days, the ideas of forgiveness, togetherness and hope in the face of despair really underline and highlight this slice-of-life story. Zan, Caden and Sienna all have wonderfully distinct voices that draw you in to their predicaments, decisions and lives. I couldn’t help myself from wondering what I would decide to do with my time if I knew the end was mostly inevitable. Who would I surround myself with and what would I do? What would you do? ARC received at Book Expo America 2013 from the publisher. Thank you! The Girl Who Circumnavigated Fairyland in a Ship of her Own Making by Catherynne M. Valente has to be one of the best books I’ve read lately. I am in complete awe of this story and cannot believe I waited this long to pick it up. September’s adventures in Fairyland are seared in my mind and I reveled in every second spent journeying with her from the moment she makes it passed customs to when she finds herself traveling the seas to a Lonely Gaol at the bottom of Fairyland. Our heroine, September, is a breath of fresh air – twelve-years-old and still Somewhat Heartless (as most children are), she of course excepts an offer from the Green Wind to hop on a Leopard and go Adventuring into Fairyland. She leaves behind her life and her mother (and father) with hardly a thought and goes off to see what awaits her in Fairyland. And oh September…what Adventures you do have! Throughout the story, despite the hardships she endures (since all good Adventures inevitably have hardships) she manages to prove over and over again what a smart, resourceful, capable, and kind person she is. September makes many of the decisions she does in order to help her friends, or do what she thinks is right. The decisions may lead to trouble, but she makes them anyway. Her friends are wonderful as well. The Wyvern A-Through-L that is born of a Wyvern and a Library (he’s a Wyverary!) and the Marid Saturday – a blue boy who grants wishes but must first be wrestled with and lose. Then there is also the Marquess, the seeming villain of the book who rules over Fairyland, and my favourite – the omniscient narrator who keeps us informed of subtle goings-on. Fairyland is full of the kinds of fantastical creatures you expect to find in Fairyland and some new ones – like a pack of wild bicycles and items that you find in every day life like lanterns that have reached the age of 100 and become fully sentient. There are quests for a spoon and sword respectively, a grand city, a journey across the sea and a kidnapping. there is wonderful lore for changelings and a back story of a kind Queen who all believe killed by the newer Marquess who is but a young girl herself and slightly cruel (though her backstory is heartbreaking). And all of this is made so real through the magnificent writing of Catherynne M. Valente. It has been ages since I have read a book that wrapped me up in its words so completely. They’re lyrical and wonderful and absolutely perfect for emotion and description. Gorgeous. The Girl Who Circumnavigated Fairyland in a Ship of her Own Making by Catherynne M. Valente is one of those rare books that comes along and changes the way you read. Topics of family, friendship, politics, identity and more are woven throughout one young girls fantastic adventures in a strange and beautiful land not her own. 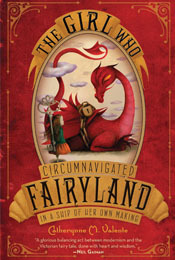 The Girl Who Circumnavigated Fairyland in a Ship of her Own Making deserves to be re-read at any opportunity because I just know this is one book you will only grow to appreciate more the more you visit it. Posted in Book Reviews, Challenges, YA Fiction - fantasy/sci-fi	by Cait H.
Take China in the future, add in a plague, androids, cyborgs and a colony on the moon that has become it’s own civilization and you get Cinder. Cinder is a cyborg living in New Beijing. Life is simple and routine as a mechanic until in one day, she is visited by the Prince who needs her expertise, and the plague breaks out in the market. Soon, Cinder is swept up in more intrigue than she could imagine, and more than she wants. I enjoyed Cinder for the sci-fi and fairy tale re-telling aspects, mostly. I think there were a few reasons I wasn’t as in love with this book as I wanted to be – hopefully I’ll be able to get them across right. First was Cinder herself. I didn’t connect with her like I wanted to. Cinder spent most of her time worrying about what Prince Kai or others would think (or thought) about her being a cyborg. She’s supposed to be an amazing mechanic, but besides fixing an old car all we really see her do is hit things to make them work and remove a futuristic version of an SD card from an android. But, no matter how much I didn’t connect with Cinder, she showed glimpses of being strong and independent (and a little rebellious) and by the end of the book was completely focused and in charge of her life. So she grew on me. Prince Kai was similar. Nice guy, you can tell he’s going to be a good Emperor, but he felt a little off. I also didn’t get the romance between Kai and Cinder – it seemed strained and not needed. I loved the sci-fi aspects of Cinder. The androids and cyborgs, the new world government, even the idea of the plague. This is a book rich in description and you can’t help but fall into the world that Marissa Meyer created. The Lunar colony was an interesting add-in to the world, and one that at times worked for me and at times didn’t. Queen Levana is a thouroughly despicable villain and her plot was great. The glamour and “magic-but-really-science” part of the Lunar physiology confused me a bit, especially in a few parts involving Cinder. I understand the idea and how it’s used, and that in these instances Cinder herself is meant to be unsure and confused as well, but for me – the reader – the confusion always made me feel like I had missed a part somewhere. The Cinderella part of the story was faithfully redone – and very well, I might add – and the sci-fi future was a perfect setting for it. I think, for me at least, Cinder is just a very full book with a lot going on. Overall, I was completely entertained and I enjoyed the story. I feel it is definitely a debut to check out, since my complaints are very unique to my own tastes and likes in books. The writing is great, and like I mentioned earlier the detail and world building is amazing. 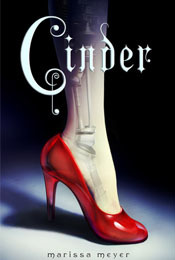 Cinder is part of the 2012 Debut Author Challenge hosted by The Story Siren. For those of you that enjoy audio books, Macmillan has graciously offered an audio clip from the first chapter of Cinder. What happeed to Jenna Fox? And who is she, really? I don’t know what took me so long to finally read Jenna Fox, but I’m so glad I didn’t wait any longer! The Adoration of Jenna Fox is one of those books that weaves the science fiction elements so cleanly throughout the book that you could almost believe that you are reading about present day technologies and concepts. Jenna wakes up from a year long comma with no to little memory. She is living with her mother and grand-mother, while her father occasionally comes to visit from their old hometown where he still lives and works. Jenna watches videos of the life she had before the accident, and as she goes to school and live her life, she slowly remembers who she used to be. Who Kara and Locke are (two names she never forgot) and what happened the day of the accident. Since the reader is looking at the events in the story through Jenna’s eyes, we discover her past as she does, and are in the dark when she is in the dark. It is only slowly that we get to understand what happened during the day of the accident, and why Jenna has to live in a different state, for all intents and purposes, hiding from the world. As Jenna remembers, the reader begins to understand Jenna better, and what life and family/friends means to her. We discover who Kara and Locke are to Jenna, and why their names stayed with her despite the amnesia. As Jenna realizes who – what – she is, all the different emotions come through the writing loud and clear. I really enjoyed Jenna’s character; even thought she doesn’t know who she is, the reader gets a wonderful sense of her personality. Lily, her grandmother, is also quiet interesting to learn about and her reactions are very on track with the situation. I didn’t really connect with the mother and father – I didn’t feel I got to know their characters well enough. On the other hand, even though we never see them, I felt connected to Kara and Locke through Jenna. She revolves around them for a long time, and a major part of the story is dedicated to the mystery of who they are to her. The only part of the story I felt didn’t quite work, or really belong, was Dane’s character. I kept waiting for something more to happen, and it never did. He was intense, and creepy and it seems like he’ll cause something to happen to Jenna, but he just stays creepy. It was kind of a let down, actually. Aside from him, though, The Adoration of Jenna Fox is a well-written book full of good story, characters and science fiction concepts, with intense moments of mystery driving it. It’s so good! I won’t say too much for fear of spoilers. This is one book where the major plot points and ideas need to be discovered as you read. The story as to be lived as Jenna lives it. Thrown into solitary confinement for his failed escape attempt from Furnace Prison, Alex Sawyer struggles not to let the hellish pitch-black silence overwhelm him. Before another escape attempt is even possible, he must first survive the nightmare that now haunts his endless nights. Because the hole doesn’t need monsters to do its dirty work – not the usual brutes in black suits and their silver-eyed, fleshless hounds, or wheezing freaks with filthy syringes. All it needs is Alex and his own fears, now that he’s seen firsthand the terrible fate awaiting him and his mates in Furnace’s secret tunnels and labs. In 2009, Escape from Furnace: Lockdown was one of my favourite books. I was so anxious for the sequel to be released, but at the same time worried it wouldn’t live up to that first amazing book. I shouldn’t have worried – Solitary did not disappoint. The story picks up immediately where Lockdown left off, and the suspense and action doesn’t stop. The imagery and feeling present is still so gritty, dark and hopeless. Alex is still just as determined to escape Furnace as ever, and he latches on to any hope he can get. Alex doesn’t just sit and except his fate, or let it break him (though he’s definitely damaged. He wouldn’t be human if he wasn’t effected by the horrors of his prison). I missed seeing the day to day interactions of Alex and the other inmates of Furnace, but Solitary gives a deeper look into the Warden, Wheezers and the men in black suits that run Furnace, and terrify the prisoners. There are some other…monsters, I suppose, introduced and the Rats are truly horrific. Solitary brings us so much closer to understanding how the Warden can get away with how he runs Furance, and I just want to scream at anyone above ground. How can they not realize what is going on in this prison for teenagers? Obviously there is a massive conspiracy, and I so want Alex to be the one to bring it all crashing down. But he’s a criminal…a teenage criminal (for murder, no less), and even though he was framed, who will believe him over the Warden, and the mysterious person who is really in charge? I’m so anxious to see where everything ends up, and how Alex is going to escape being changed into something not-human. Solitary is definitely a solid second-story, and will chill readers with it’s dark descriptions of Furnace, a place that would rival Hell. This book holds it’s own, and though it sets up things nicely for book three, it in no way feels like filler material. Readers will hope for Alex to succeed in escaping and bringing down Furnace…but Smith takes advantage of the cliffhanger and leaves you breathless and wanting more. Right now. *Thank you to Macmillon (Farrar Straus Giroux) for sending me a copy for review. Fourteen-year-old Trey Laporte was “just a kid.” Not anymore. Not after the day he wakes up in agony – retina-splitting, vomit-inducing agony. His clothes are torn. His room is trashed. Now, demons are closing in on every side, and the most psychopathic bloodsucker to rock the Netherworld wants to destroy him. And Trey is falling for a girl who is half vampire, half human, and insanely pretty. Above all, Trey must face one terrifying question: is he a boy…or is he a werewolf? Wereling is the story of Trey, for all intents and purposes an ordinary boy. Until he isn’t. After one night where he wakes up aching and sick, he is suddenly whisked away by a stranger claiming to be his uncle. All too soon, Trey is living with the reality of vampires, demons and werewolves. The werewolf? Trey. His life? In danger from a power hungry vampire. Wereling starts off strong. The description is great and Trey’s emotions come through bright and clear. Right from the start, we’re thrown into the action of the story and it seems that the reader is in for an intense and fun ride. It fell flat all to soon (for me, at least). As soon as Trey guesses that his “uncle” is a vampire, I was thrown for a loop. Trey comes to that conclusion very quickly, and seems to accept the idea as fact right away. I can live with that, though, even if it’s a little abrupt. The writing is still good, I’m liking Trey and the promise of action is still there. So everything’s going pretty good, until I reach the end of the book. Although written in third person, the narration focuses on Trey…until two chapters near the end that disregard Trey completely and focus on Lucien, Trey’s vampire “uncle”. A little odd, but ok. But the end! It made me feel like I had been watching a tv show. The main plot of this first book was wrapped up nicely, everyone’s back home and sitting around (though Lucien is a little worse for wear), when suddenly…big reveal, and off they must go on another adventure. Very episodic feeling and it just didn’t sit right with me. Something I did enjoy – the blurb on the back of the book mentions Trey falling in love with a half-vampire. While this mini-romance is present, it’s incredibly realistic and I enjoyed that aspect of the story. Trey acknowledges that he thinks Alexa is beautiful and that he likes her, but they don’t immediately start going out, being in love, etc. In fact, they can argue pretty well with each other. It’s nice to see a book with a romance aspect still rely on the action part to drive the story. Trey’s transformations to a werewolf are perfect, too. Instead of the actual wolf most werewolf books are sporting today, Trey turns into more of a wolfman – still standing on two legs, just covered in fur and with a wolf’s head. Overall, Wereling is a good book with an awesome werewolf and some great action, and I enjoyed it. Definitely worth a try if you like werewolves! The sequel, Dark Moon, will be out in February 2011. I received this book from a contest held by Teens Read and Write.